The SUGAR Group Welcomes New Staff Member! Please join The SUGAR Group in welcoming our newest staff member to the team. 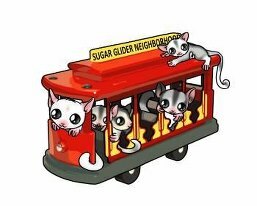 Cana is joining us as our Media Coordinator and will help to introduce and market The SUGAR Group outside of the online glider community. Cana had a glider that she loved very much for 10 years. Monkeypox was very special to Cana and she didn't know about the online glider community until he became ill. At that point, she did all she could to help her boy, but he passed. When she learned about The SUGAR Group and their goals, she knew she wanted to be a part of the organization. We are very happy to have Cana on board and have many exciting projects in the works that we are eager to share with you all.